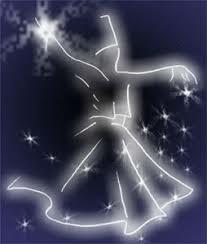 Time for another dance with Rumi. His words refer to his personal search and passionate, intimate connection with the divine presence within, which experiences ecstatic interplay with the divine presence without (ie, in others). I have died to myself and I live for you. Let us be neighbors to the stars. In the unknown, in the un-manifest.